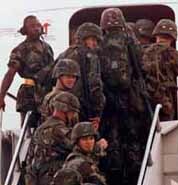 Fort Hood soldiers board plane bound for Kuwait (AP). The first of some 3,000 soldiers have departed for Kuwait. Defense Secretary takes responsibility for leadership failure in Saudi bombing. © COPYRIGHT 1996 USA TODAY, a division of Gannett Co. Inc.